As the season turns to Fall, we have a lovely abundance of fruits and vegetables coming through the garden. For the cold months to come we’re making applesauce, sun dried tomatoes, frozen pears, and even some acorns – all part of the Autumn harvest ritual. 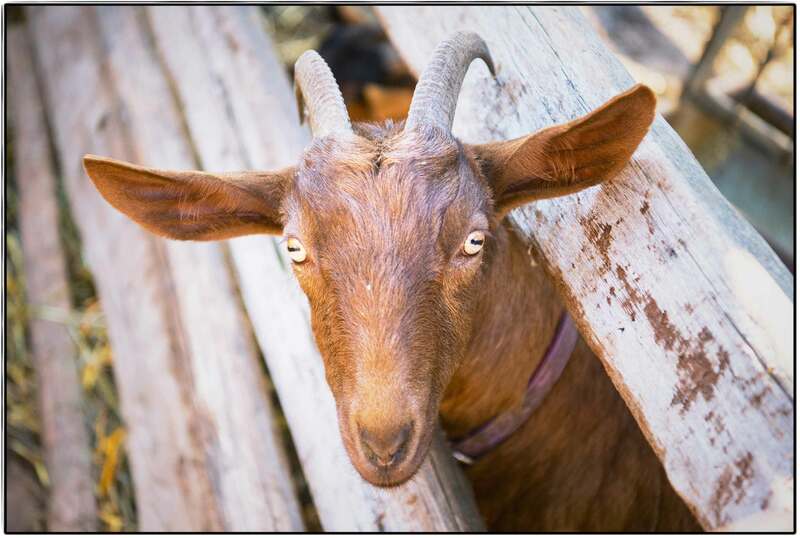 The grapes are in full swing, and once they've been harvested from the home ranch, the domestic animals from the farm get to forage in the vineyards once again. 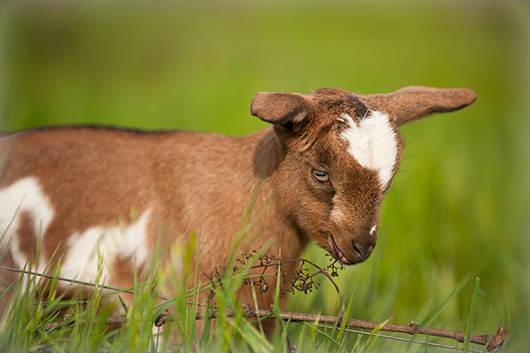 Grass is great, but goats have a definite sweet tooth when it comes to munching leftover grapes on the vine! 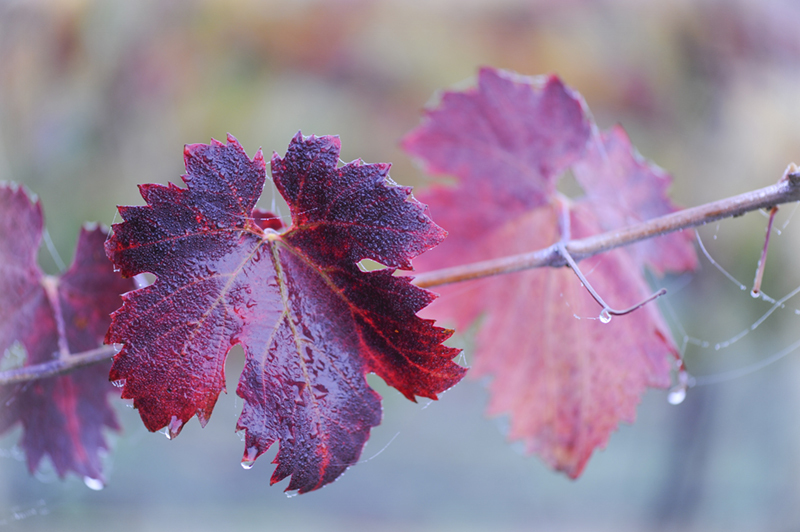 Grapevine in fall colors after light rain. Along with the bounty of fresh, ripe produce, the herbs which will grace our dishes for the year to come are in full profusion at present, and it's a lovely and lively time to harvest our spice mixes before the rains and cold take their toll. We are hoping for a flourish of good, long soaks. We had our first major rain already, and we're all wondering what the weather will bring for the near future! Each morning a cool coastal overcast blankets the sky, so we can harvest comfortably on the early side before the heat sinks in. Little sprouts are popping up in the fields, and the land is thirsty for consecutive downpours. Even that little taste of the wet weather got us all excited about the down time of a farmer's lifestyle: while rains let loose all around outside, we get to curl up with some herbal tea by the stove and read books, plan out next year's garden, and rejoice in the past year's foods in the form of homegrown sourdough wheat breads and warming squash soups. 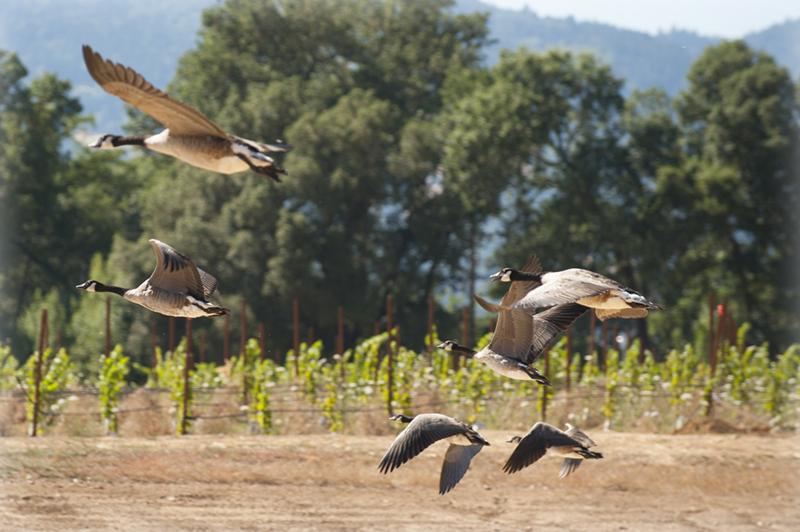 Canada geese take flight at Frey Vineyards. At the end of summer one of our cows gave birth to a beautiful heifer calf. The newborn playfully explores the barnyard, getting into mischief that only such a huge baby can! The milking pails are filled to brimming each morning with the new mama in milk, and so we've been working with new cow cheeses in the kitchen. Also, our farm interns just made their first batch of goat milk soap, and are letting it cure in the outdoor kitchen. Spiderweb in oak tree at edge of vineyard. 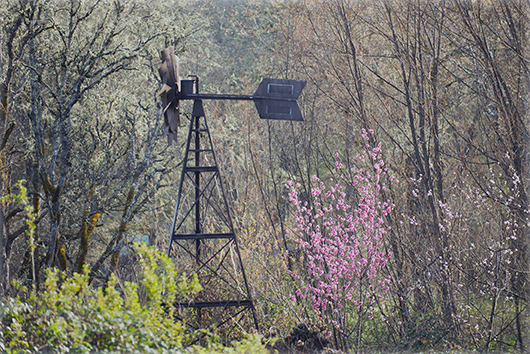 Spring Approaches on the Farm! 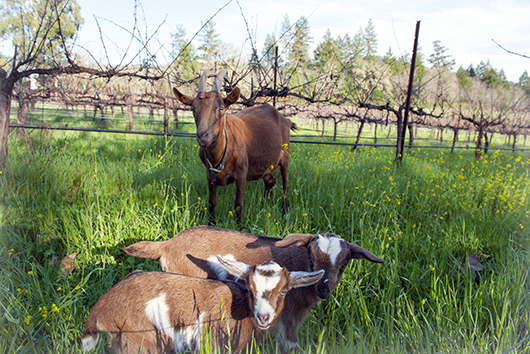 Goats grazing in Frey organic vineyard. Spring on the Frey farm has come early this year. The sun shine and rainfall has made a lush and lively winter. Baby lambs frolick in the meadows. Pregnant goat moms are heavy with kids as they take their daily walks to browse and fertilize the vineyards. Our duck and chicken friends have recovered from the cold weather with lots of deep orange egg yolks from their free-ranging escapades. The days on the farm are spent managing the farm animals, lettiing them eat the rich green grasses. My husband and I tend the herd of goats. We milk and walk the goats each day, and bring them special treats like raspberry and blackberry leaves to prepare them herbally for the kidding season ahead. I try to notice which of the does is "bagging up" in the udder, which indicate she’s pregnant. During this month I'll make several trips to the barn to check if anybody is showing other signs of babies on the way. Fresh straw is spread out, and we partition off parts of the barn as the “delivery rooms.” This year, three goats are expecting: Sophia, Cardamom, and Lhasa. I like to be the midwife, helping along any births, and giving the mother a post-partum tonic of molasses, wheat bran, and ivy (a recipe that I got from Juliette Barclay Levi's fantastic work "The Complete Herbal Handbook for Farm and Stable"). As the sun warms everything up and the days get longer, we’ve been making Biodynamic preparations. They are made at the farm with ingredients from the farm, and stored in ceramic vessels. We apply the "500" preparation in the spring to bring renewed strength and nourishment to the soil. My father-in-law, Luke Frey, has been studying these Biodynamic formulas for over a decade. The preparations foster vitality in the soil and to the farm as a whole. 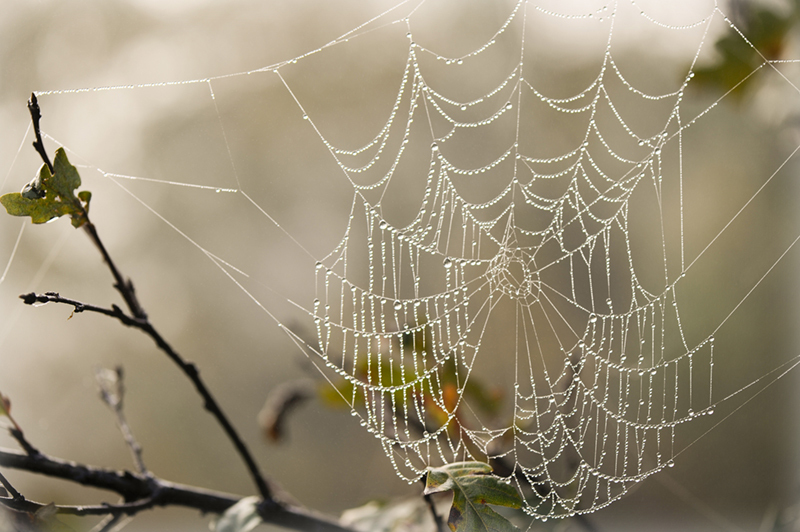 Biodynamics were brought forth by Rudolph Steiner in 1924, and treat the farm as one large self-sustaining organism. We add these "preps" to hand-swirled water vortices, acting as homeopathic medicinal blessings of fertility and creativity for the farmer, the farm, and the planet. 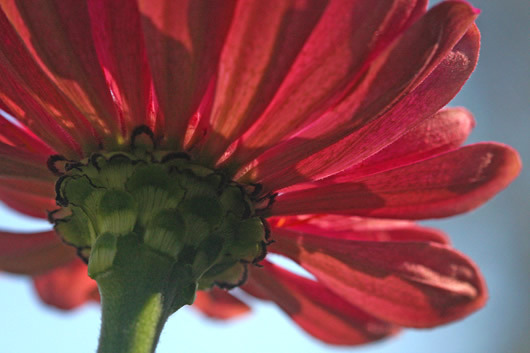 Biodynamics goes beyond organic, connecting the soul to the soil. 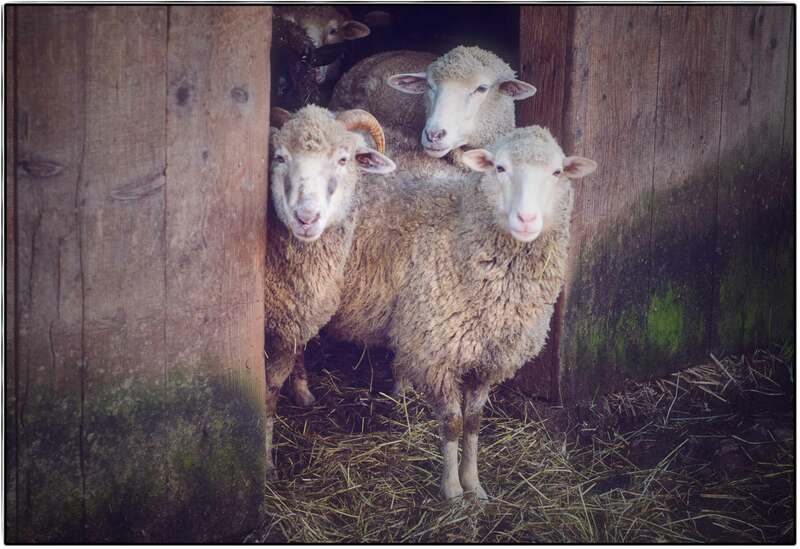 Click here for more information about Biodynamic agriculture. The weekend begins Friday January 9th, with a lecture from Dennis Klocek of the Coros Institute on the topic Where is the Elemental World? From the course description: "The fundamental question is how can those who work with nature establish a relationship that is personal to the forces and activities that lie behind natural phenomena? Starting in the crystal heavens of the alchemists, Dennis will present the layers of forces consolidating from the cosmic etheric realm through the etheric formative realm to the elemental realm. At each stage meditations will be suggested that can help to link the consciousness of the worker to these particular kinds of phenomena and the beings who stand behind them. Topics will include: the four ethers; crystallization of gems; alchemical planetary influences through the seasons; salt and sulfur in plant growth as symbolic consciousness; and the spagyric process of the alchemist Paracelsus as a meditative tool for research." The lecture begins at 9am and goes until 5pm. There will be a lunch break and a suggested donation of $85-100; nobody will be turned away for a lack of funds. Registration is available at the door. Saturday the schedule is open to the public and free (for the full schedule with a timeline please go here). There will be a keynote speech by Dennis Klocek at 10am and also a Nature Walk with local author Kate Marianchild at 2pm (her book, "Secrets of the Oak Woodlands" was published by Heyday this year). Bring a potluck item to share at a delicious farmer lunch gathering midday. 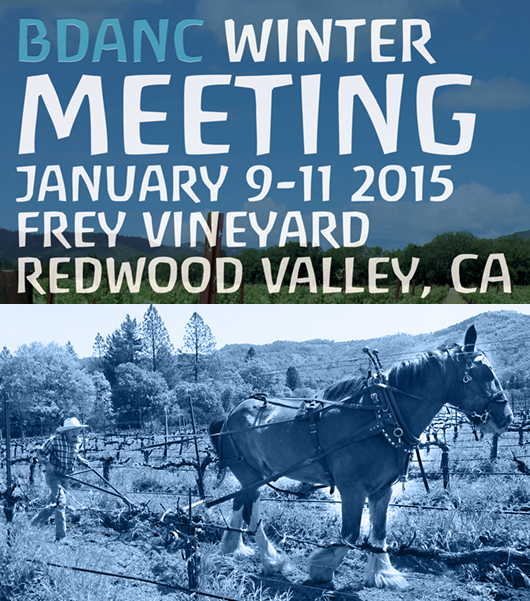 Biodynamic preparations are often available for purchase, and for those interested in more information about biodynamics and the BDANC, this is a fine event to attend! Sunday's meeting brings together the BDANC staff to discuss topics within the organization. 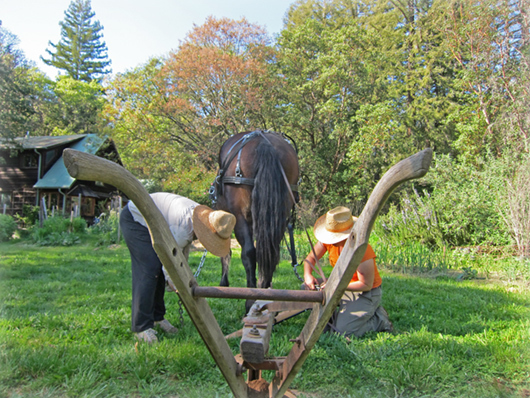 I recently interviewed Julia Dakin, a local horse woman here in Mendocino County, California, about the horse powered work that’s been happening on the Frey farm. A life-long horse enthusiast, Julia got interested in draft horses a few years ago. She wondered if it would be possible for local vineyards to convert to horse power to do the work currently done by tractors. She met up with Luke and Lily Frey, who have been experimenting with draft horse work on the farm for the past several years. Luke and Lily have been working to develop a rapport with draft horses on the Frey farm. 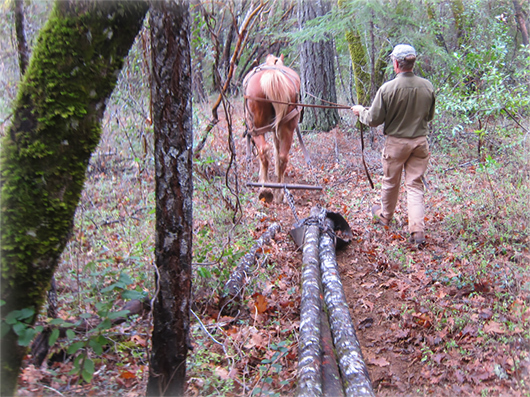 As they built relationships with the horses, they have branched out to harnessing the horses and accomplishing farm tasks and logging with the horses on the land. 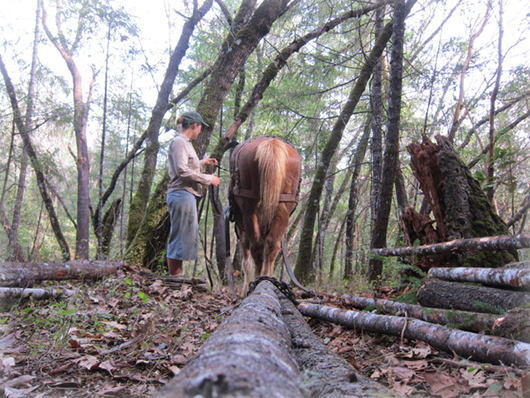 Julia noted that logging with horses is one of the most environmental ways to do forestry management, as the horses are able to get into more narrow and tight spaces with far less impact than a road and heavy machinery. The horses get to exercise, and the land gets tended more gently. 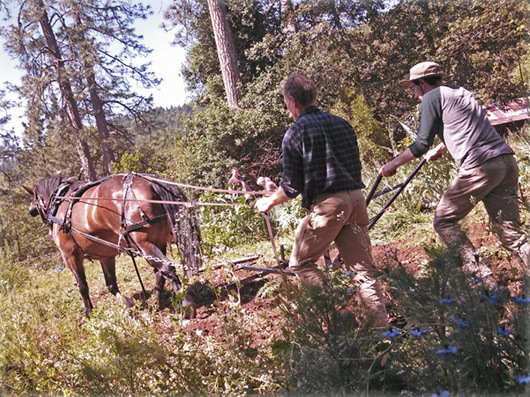 This last spring, Andy, Bonnie and Lola (the horses), accompanied by Luke, Lily and Julia (the humans), pulled logs out of the forest, tilled the garden beds on the ranch’s biodynamic farm, and tested various implements in the vineyard. From experiences with the horses, Julia took her research a step farther and enrolled in online classes by Elaine Ingham in soil science. Her studies led her to the field of no-till agriculture. 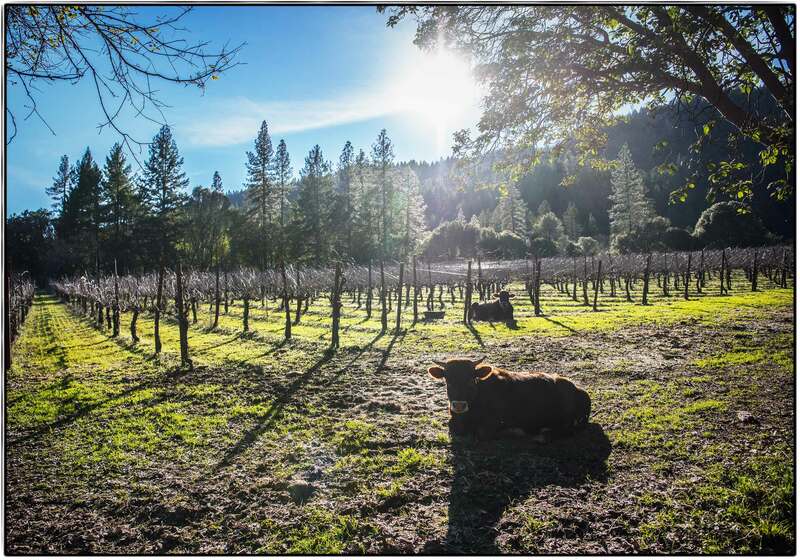 As she’s been delving into the world of soil, she’s been postulating that horses might be able to create a niche for vineyard management, by practicing no-till methods with a roller-crimper tool that is hitched to the horses. Instead of tilling up the soil with a disc, which disturbs the soil life (worms, bacteria, fungi), the roller-crimper moves between the vineyard rows to smash down the cover crop. If Julia’s work with the horses is successful, they may have a more efficient system of converting cover crops into soil fertility. Also, using the roller-crimper helps sequester carbon in the land, while protecting and nourishing the layers of soil ecology already in place. 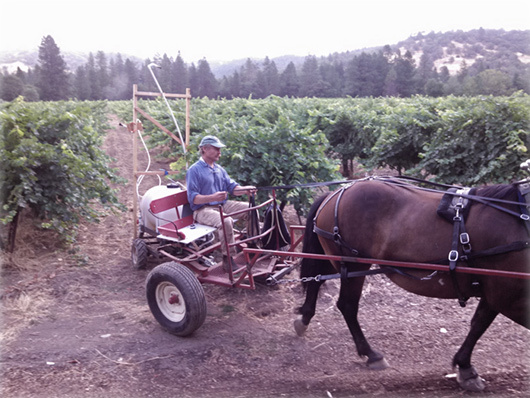 Julia also hopes to find through current research on test plots, that the soil being worked with the roller-crimper both enriches the land and could prove to be a cost-effective enterprise for local grape farmers, whether or not they use horses. Julia currently has horses that she’s working with to amass some data to look at the roller-crimper horse-power at different sites. Should her efforts prove qualitatively impressive, Julia would like to expand the ways that local vineyards become carbon sinks instead of a carbon source, by transitioning to more horse-powered tasks: seeding cover crops, mowing, roller-crimper, and perhaps harvesting. Additionally, as part of the biodynamics program on the farm, we prepare a unique blend of organic, homeopathic herbal sprays that we apply to the crops to nurture soil fertility. At present, Julia and Luke have been having some horse-powered spraying sessions to see how the horses fare as the deliver mechanism for these potent land medicines. There are several factors to weigh in about how and if a farm would convert to a horse-powered technology. Julia is quick to note that with the prevalence of cheap oil and the speed of mechanical inventions, horses have been relegated to a technology of the past. However, with the use of more innovative techniques, like no-till, horses may well prove themselves to be able to compete with mechanized technologyfor the lesser impact they have on the carbon footprint of the land and for the potentially important contribution to increased soil fertility. 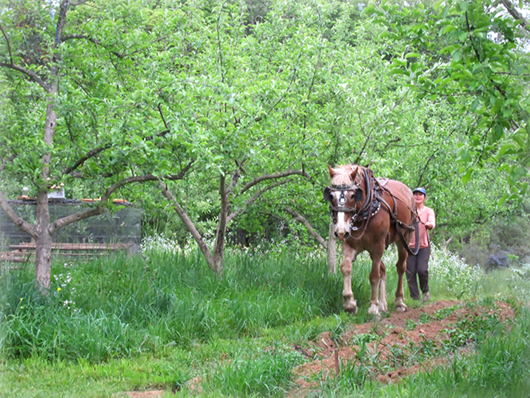 For more information on Julia’s research with the horses, follow her blog at www.rganicnotill.com. Click here for a YouTube video clip. 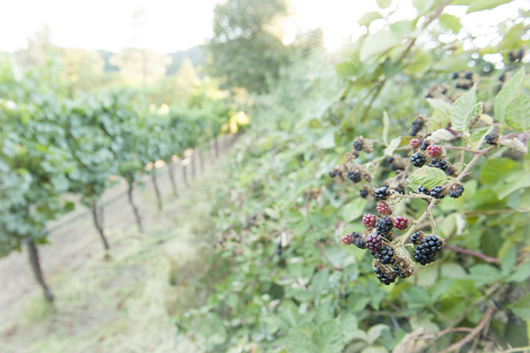 Blackberry hedge next to Frey organic and biodynamic Chardonnay vineyard. Hot summer days have brewed up delicious batches of tomatoes, cucumbers, eggplants, and basil. Our Mediterranean climate offers us a diverse crop of annuals to accompany the vast bounty of vineyards coming into fruition. The gardens are producing all kinds of delectable veggies, but the grapes are still getting the solar power they need for their glory in the Fall. 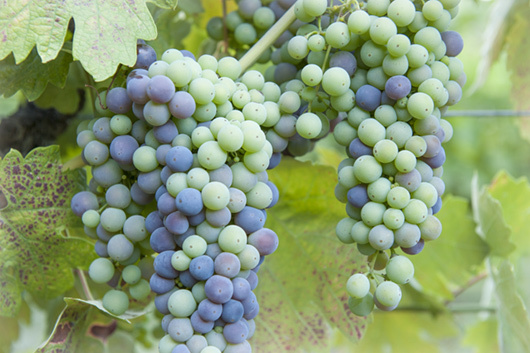 I watch the grapes ripening each morning as I walk the rows, the clusters getting bigger and bigger as the weeks go by and the sun shines down. When the summer heat has passed, the fruit will be plenty plump and their sugars rich enough for the harvest! In Spring, my food foraging walks in the vineyards began with ripe mulberries; now there are peaches, too. The blackberries in the hedgerows are wildly stretching their tendrils. Besides providing food and habitat to local wildlife, they are one of my favorite foraging delights. 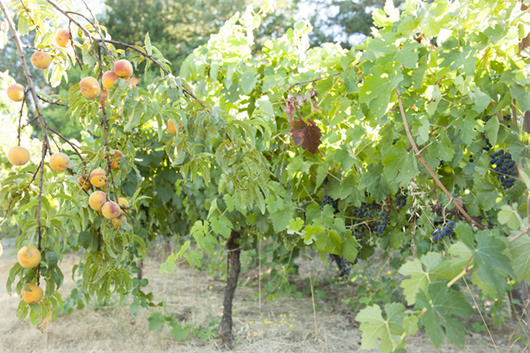 Ripe peaches in the vineyard! The grapes take center stage as the heat wanes and the season shifts to cooler days and longer nights. 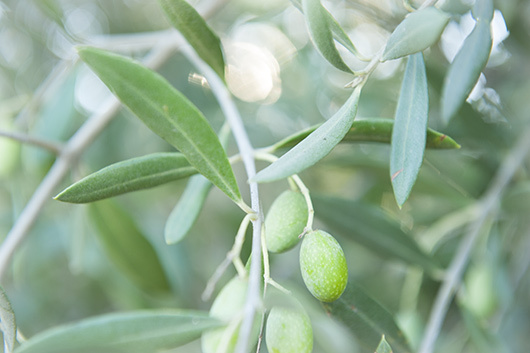 Last but not least, our olive trees will be ready to give their gifts to the press for full-bodied oils. When enjoying a bottle of Frey Biodynamic wine, we hope you will appreciate the terroir of the land that encompasses the richness of not just the grapevines, but the diverse array of flavors, in concert. Organic olive tree in Frey biodynamic vineyard. We waited five months for all the baby goats to arrive and finally last March our herd of mothers delivered the next generation! 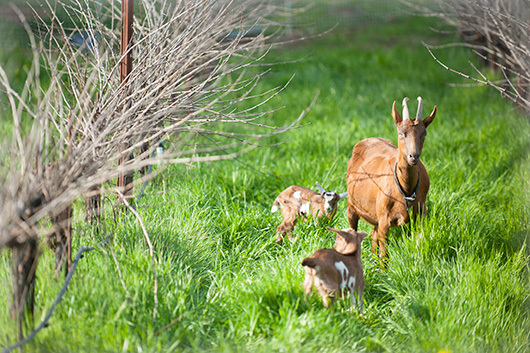 Ten baby goats joined the farm family with 8 of those being billy goats (males). Only a few weeks old, they're already learning how to play with each other by butting heads and frolicking in the fields. Each day Daniel herds the rambunctious crew to the vineyard in front of the winery where the grass is particularly lush this season. We've been having lots of visitors who come to meet the goats. Baby goat nibling on a grape stem. Last week, in all the excitement of walking the goats back from their pasture to the barn, one baby black goat got left behind. The little billy must have been hiding with the cows or the sheep who were also enjoying the pasture when the goats were called in. When we went back to get him, we were delighted to find that the little goat made new friends with his pasture neighbors the cows. In fact, he had established a special bond with Maybelle, who happily allowed him to nurse to keep his energy up while his goat mother was unavailable! Sweet spring days of milk on the Frey farm! 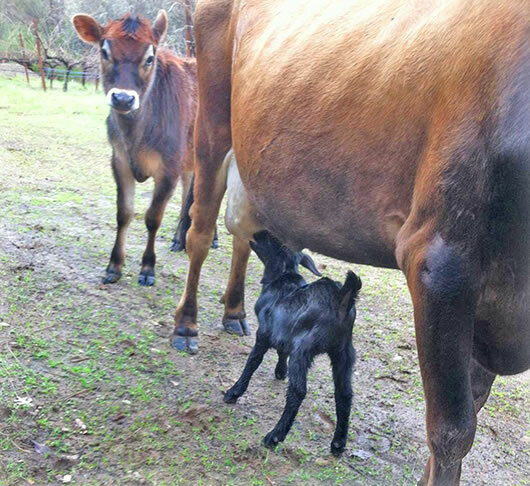 This orphaned goat found a bovine surrogate while its new step-sibling looked on. Later it was returned to its mama goat. Surrounding our estate organic and biodynamic vineyards are woodlands and forests that harbor wildlife and sustain local biodiversity, including the wild honeybee. This vital pollinating insect is suffering worldwide from colony collapse disorder, widely believed due to it's extreme sensitivity to modern pollutants, including agricultural pesticides, that weaken their immune system. So last year when we spotted a hive in need of help right at the edge of our Petite Sirah vineyard, we quickly gave them a hand. 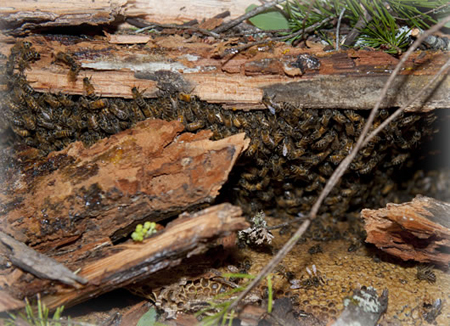 The hive was located inside this fallen fir tree. The bees had their home high up in a fir tree, inside the rotted and hollow interior. A windstorm snapped the tree halfway up and the hive fell. 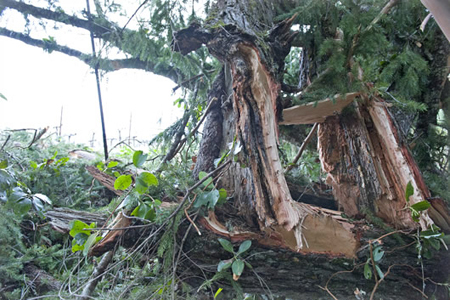 Much of it shattered on impact with crushed honeycombs seeping across the splintered trunk. We were tempted to eat some of the honey, but this food was vital to the bees if they were to survive the rest of the winter, so it was hands off the sweet ambrosia. Luke Frey quickly brought an empty beehive box and put the surviving humming mass of bees in it along with every drop of their precious honey. 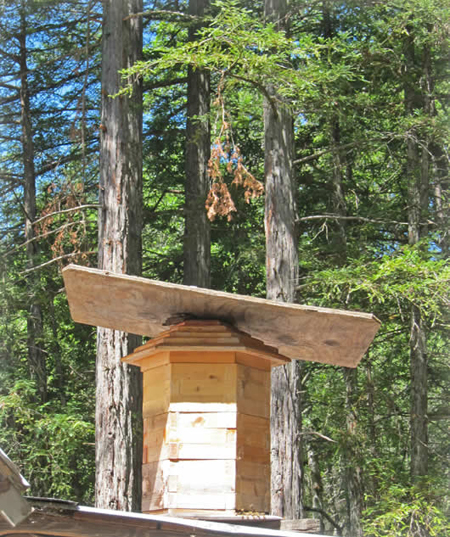 Then he placed it on top of the fallen tree right next to the old hive. 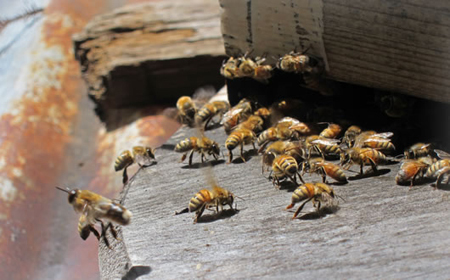 Here's a short video with some live footage of these beautiful wild honeybees. It was soon apparent the queen did not survive the fall so a frame with two capped queen cells were put in. We crossed our fingers that the orphaned honeybees would take to their new home and raise a new queen. A few weeks later they were still there! Following the coronation the hive raised a new brood into the spring and summer. But then they were gone! We suspect that they swarmed and made a new hive in an old wine barrel by our Merlot vineyard. It's also possible the colony perished. Wild honeybees and their shattered, exposed hive. The location of the honeybee's new hive is circled, next to the Frey Biodynamic Petite Sirah vineyard. What is a wine sensory garden? The following is the work of Shannon Jasie during her summer internship at Frey Vineyards. "Tasting wine is a full-body experience. Wherever you taste wine, the colors and smells of the tasting area, as well as your mood and state of mind, influence how a wine tastes. Wine sensory gardens deepen the sensory experience by incorporating sight and touch. When tasting wine in a garden, the aroma is enjoyed by the nose, and the taste and texture by the mouth. Upon entering the space, you are surrounded by the color and scent of the garden and the plants whose flavors are used to describe the particular varietal. This enhances your tasting experience and compliments the flavor and aroma of the wine." and flowerbeds, pick a sprig, leaf, or petal from the herbs and flowers whose aromas and flavors will compliment the wine. As you taste each herb, sip your wine and savor the new flavors that are exposed through the pairing. Try our suggested pairings of Frey wine with garden herbs and edible flowers. Anise, Thyme, Sage, Honey, Tarragon, Lavender, Squash, Blossoms, Lemon Verbena Violets. Gewurztraminer: Rose Petals, Mint, Lavender, Rosemary, Lemon Verbena, Honey, Nasturtium, Rose, Geranium, Jasmine Blossoms, Cornflower. Sauvignon Blanc: Lavender, Tarragon, Rosemary, Cilantro, Parsley, Sorrel, Lovage, Dill, Hay & Green Grass, Lemon Verbena. Natural White: Tarragon, Marjoram, Thyme, Chevril. Cabernet Sauvignon & Merlot: Sage, Rosemary, Oregano, Chocolate Mint, Chives, Nasturtium, Dill, Bee Balm, Pansy, Snapdragons Chrysanthemum. Pinot Noir: Violets, Squash Blossoms, Fennel, Sweet Basil, Oregano, Chocolate Mint, Bee Balm, Pansy. Petite Sirah: Chives, Rosemary, Oregano, Lavender, Sage. Zinfandel & Syrah: Rose Petals, Lavender, Sage, Basil, Oregano, Nasturtium, Calendula, Marigold. Natural Red: Basil, Thyme, Sage, Marigold, Calendula. Sangiovese: Rose Petals, Anise, Basil, Fennel, Sage, Oregano, Pansy, Marjoram. 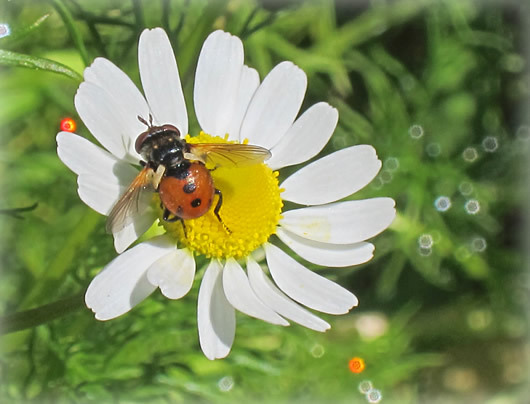 Summer is certainly the time that bees seem most at home in the world, flying all about the garden, buzzing throughout the warmth of the season's days, and kissing all the flowering blossoms that need the bee magic to produce. On the Frey farm we have been experimenting with several different styles of creative bee hive designs. The hive that I've been tending and observing the most this past year is a Warre style hive that my woodworking neighbor Kevin designed and built. The hive currently drips with honeybees, coming and going from their floral pursuits (see images below). 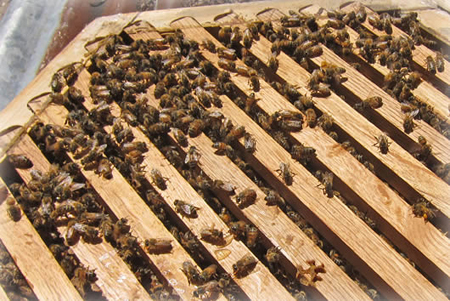 It's built in the top bar style with multiple pieces of parallel wood spanning the top of each hive-body box. Unique to this model is that the hive-body is built in the form of a hexagon, to honor the bees own sacred geometric building. Kevin also built the hive completely without the use of metal to respect the bees' keen sensitivity to vibrations in their home. This particular model is on the roof of my bedroom, to protect it from unwanted visitors, such as bears, who have been known to go out of their way to taste the farm honey! On certain days, if I sit quietly on my bed, I can hear the bees buzzing and vibrating through the walls! I've seen the hive swarm twice this year, each time swirling in elaborate lemniscate patterns, up higher and higher until they landed on nearby redwoods: too high for me to reach safely. I hoped these brave convoys made new homes successfully in the surrounding woods. We harvested a small amount of honey recently, which was a deep rich golden/bronze color and tasted of the Spring flora. As the summer winds down, the bees will travel far and wide to seek out late blooms to help flush out their sweet stores for the rest of the year, when forage becomes less and less available. But, for now, the bees are a buzz! Honeybees taking off from the beehiveHoneybee launch pad! View inside the beehiveTop of hive-box body.